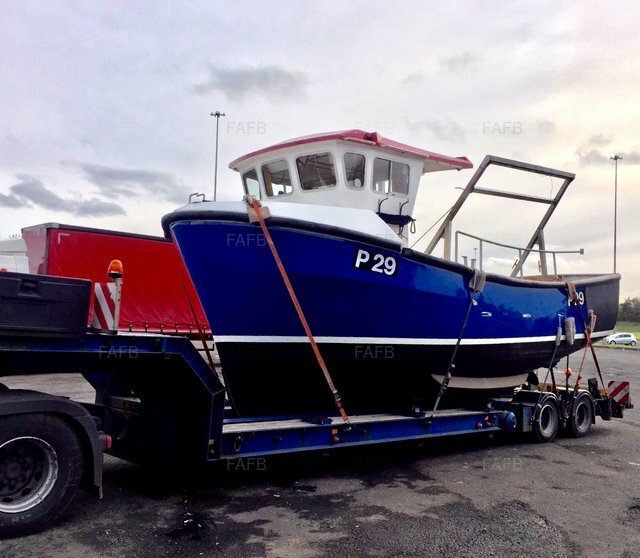 Boat transport Ltd is a small family run business that has over 25 years experience of moving all types of boats throughout the UK, including Ireland and many other countries too. We have depots in both Southampton and Stourport on Severn so we are ideally placed for hauling your boat up and down the UK. We have several low-loader artic boat trailers catering for any size or shape of boat up to 52’ approx. We also can move the smaller vessel using a 4x4. We have enjoyed transporting 100’s of fishing boats throughout the years. So, please look at our photos for a flavour of the many different types we have moved throughout the UK. Whether you are just buying your very first boat, just fancy an upgrade or need to move it for your own fishing business we can help you. Whether your boat is brand new or second hand, it will be safe and secure in our experienced hands. Our aim is to provide a professional friendly service with the minimum of fuss. We are competitively priced, easy to deal with and you will get a quick response to your enquiry. We are practical & down to earth because we just want to get the job done!